For other stations named RAF Kingsnorth, see RAF Kingsnorth. Kingsnorth airfield, 12 May 1944, photo oriented to the west (top), taken about three weeks before D-Day. The crossroads in the middle of the picture is Bliby Corner, with Sevington Lane running left-right and Chequertree Lane going top-bottom. RAF Kingsnorth was a World War II airfield in Kent, England. 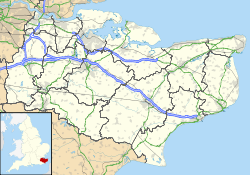 The former Royal Air Force station was at Bliby Corner approximately 2 miles (3.2 km) southeast of Ashford; about 50 miles (80 km) southeast of London. It is not to be confused with RNAS Kingsnorth, later RAF Kingsnorth, which was an airship station in operation during and after World War I. Opened in 1943, Kingsnorth was one of a number of prototype temporary Advanced Landing Ground airfields to be built in France after D-Day, as the Allied forces moved east across France and Germany. Kingsnorth was used by British, Dominion and the United States Army Air Forces until it was closed in September 1944. Today the airfield is agricultural land with few remains visible on the ground, although sections of the runways can clearly be made out on aerial and satellite photos. The USAAF Ninth Air Force required several temporary Advanced Landing Ground (ALG) along the channel coast prior to the June 1944 invasion of Normandy to provide tactical air support for the ground forces landing in France. Republic P-47Ds of the 22d Fighter Squadron at Kingsnorth 1944. Kingsnorth was known as USAAF Station AAF-418 for security reasons by the USAAF during the war, and by which it was referred to instead of location. Its USAAF Station Code was "KN". The 36th Fighter Group was part of the 303d Fighter Wing, XIX Tactical Air Command. Movement to the Continent commenced during the first week of July when the 53rd Fighter Squadron transferred to its Advanced Landing Ground (ALG) at Brucheville, France (ALG A-16) as a forward base. The other two squadrons continued to operate from Kingsnorth until early August, the main body of the group preparing to move on the 2nd. Within a few days all personnel were gone and the airfield was deserted. With the facility released from military control, the former airfield was returned rapidly to agricultural use and within a very short period there was little to indicate that RAF Kingsnorth had existed. Today the only evidence of the airfield's existence is a slight outline of the southeast end of runway 13, visible in aerial photographs. Kingsnorth Airfield is on the east side of the A2070 just south of Ashford, about 1 mile south of Bad Munsterfeld road just after the loop heading southwards. The main airfield was in the field northwest of Bliby Corner crossroads, although the runways can be traced to south of Chequertree Lane. Jefford, C G. RAF Squadrons, first edition 1988, Airlife Publishing, UK, ISBN 1-85310-053-6. Wikimedia Commons has media related to RAF Kingsnorth (WWII).